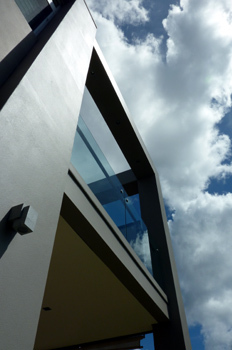 Proteus Architects design and manage the construction of projects from alterations to large new dwellings and multi-storey residential projects. Below are images from many projects over the years - demonstrating that our work has a timeless quality. Each of these images indicate the extent of our experience. What these projects do have in common is their attention to detail and uniqueness of idea. 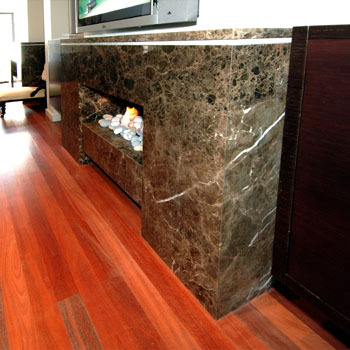 If you have a project you would like us to look at, please contact us. 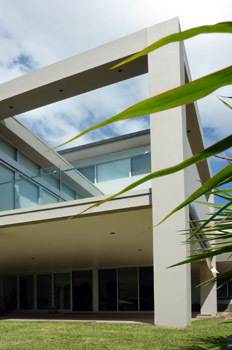 The refined balcony from up close with strong columns anchoring the design of the Euro house project. Strong columns and beams with overhead lighting bookending the design of the Euro house project. The cleanliness and minimalist nature allows the outlook to dominate. 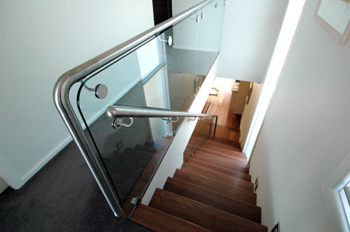 The glass balustrade and stainless steel handrail make a masterful detail. 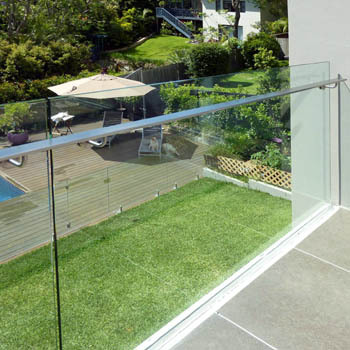 The pinned patch fitting curves under the handrail to allow a continuous uninterrupted horizontal handrail. 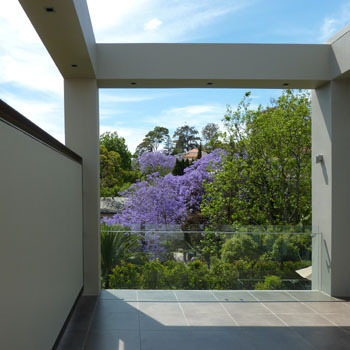 Thick walls allow sections of walls to be cut out and lined in other materials that provide interest and help to connect the house to make the design coherent and consistent. These playful elements are essential to aid in humanising design. 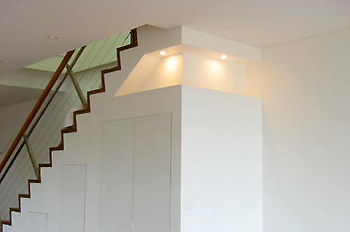 A stair is an opportunity to provide storage in small houses. This storage consisted of doors painted to blend in with walls as well as ornamental shelving that incorporates lighting. 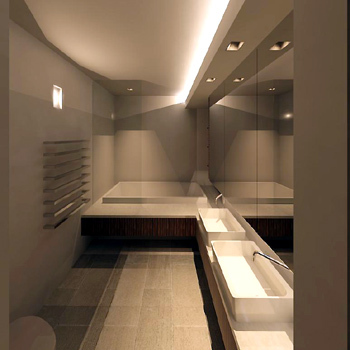 This 3d render provided the client with complete understanding of their ensuite in this small terrace. 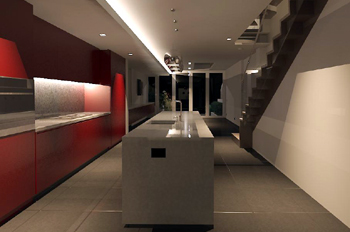 This 3d render provided the client with a view to show the integration of the kitchen within the living area in this terrace as well as the strip lighting connecting the length of the house. The stair landing is a communal space, not just a functional area. It also provides a base for the handrail and structural system to lock into. 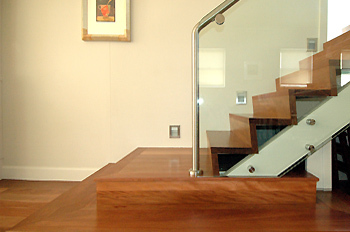 The stair here is glass to allow light to infiltrate the house. 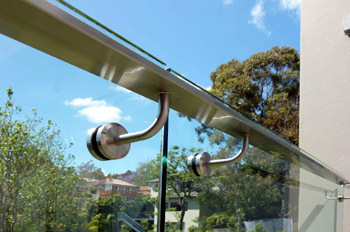 The handrail is delicately finished with minimal fittings. 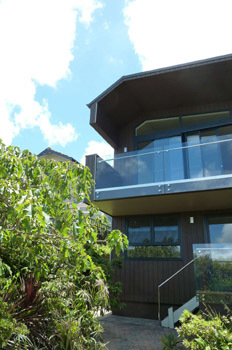 The roof of this small house has a double unequal slope providing interest and allowing framing of harbour views. The kitchen has both dark timber and polyurethane cabinets. These are offset by the corian surface which has a perfect unblemished finish that extends around 5m in length without seams. 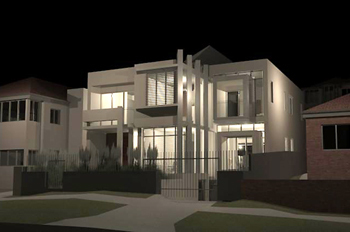 The lighting of any house is integral to the design and sets mood. 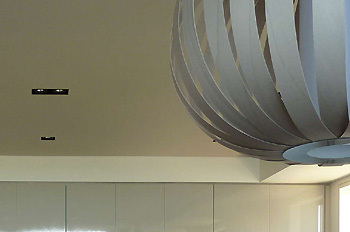 A combination of suspended pendant lights as well as downlights allow a combination of moods in the rooms. 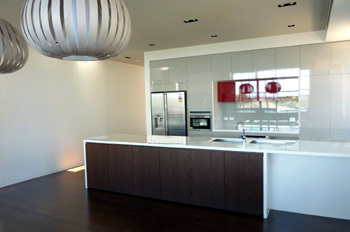 The high gloss finish to the cupboards extends the harbour views. 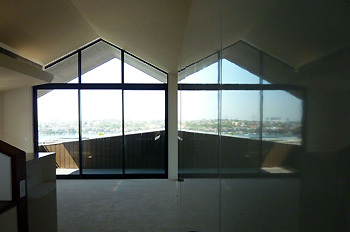 It also helps to reflect light and extends the apparent size of the limited spaces. 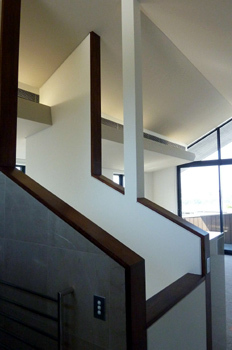 The stair void is cut at an angle to allow harbour views to be gained from the open plan ensuite. 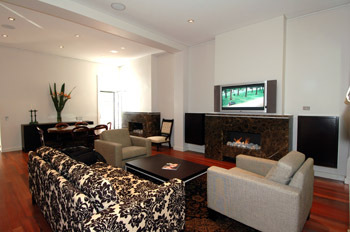 The internal finishes were completely re-done in this terrace which incorporates double fireplaces that were re-commissioned and lit by natural gas. 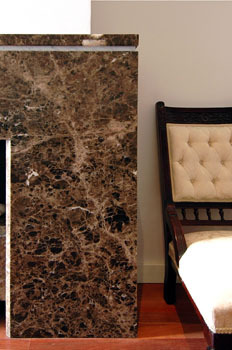 The fireplace had beautiful dark emprador marble surrounds with a thin wedge of carrara marble sandwiched between. Detail of stone used in re-commissioned fireplaces lit by natural gas with remote control. 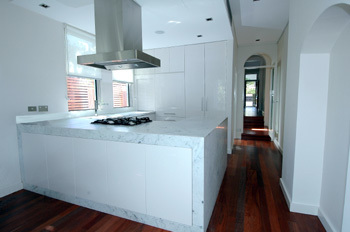 Carrara marble used extensively to help light up this kitchen in the dark terrace. 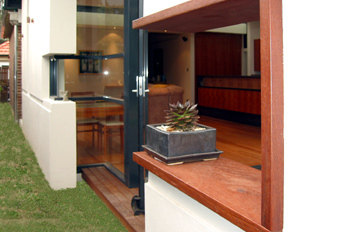 Block elements were used to surround the cabinets and incorporating the cabinets' kickboard. 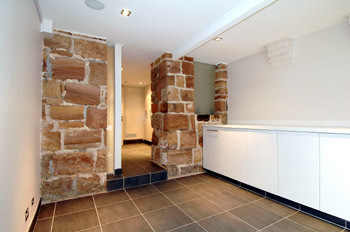 The basement was excavated and the existing stonework was cleaned and re-used. A previously unlivable area of the house is now a fantastic third level - all on a strict budget. 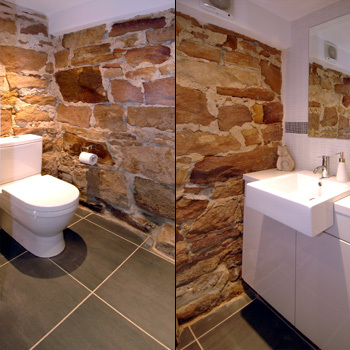 The basement incorporated a small bathroom within the existing stonework that was cleaned and re-used. 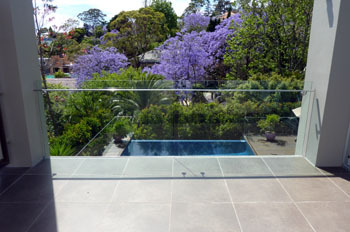 This house in Vaucluse is about to commence construction after a careful detailing process. The design is highly refined and modern with blade walls providing privacy while allowing views to the nearby ocean cliffs.